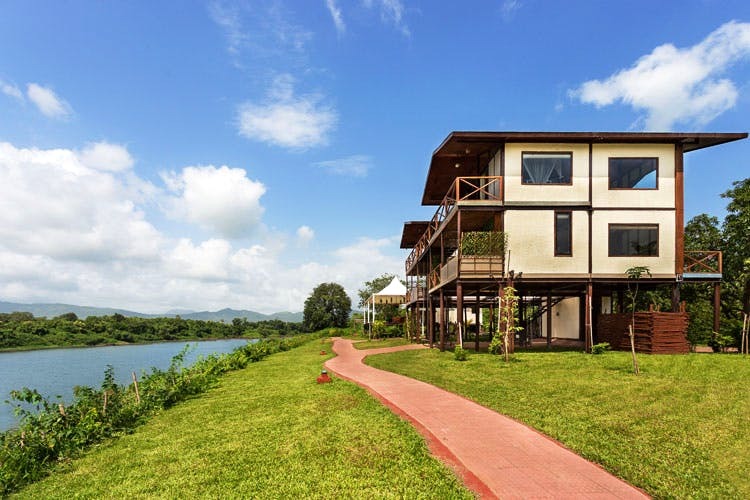 Located just 90 kilometers away from Mumbai, Anchaviyo Resort is the perfect camping ground that's enveloped in greens, and is just perfect for a blissful getaway. Here's why. Nestled inside Wada at Palghar, Anchaviyo Resort is a two-hour drive for Mumbai and you will definitely need Google Maps for assistance. This space is spread across a sprawling 150-acre land, and is surrounded by gorgeous mango, guava and chikoo trees. The staff is beyond brilliant, and they make you feel like you never left your home in the first place. It's a vegetarian concept-based resort where they have chalets (INR 13,000) mud houses starting from INR 11,000, log cabins starting from INR 9,000, and an igloo house too, for INR 17,000 (How cool is that?) The view and location of the resort are in fact one of the first reasons as to why you should be there. There’s an in-house restaurant that serves a delicious vegetarian spread.